The Union for Affordable Cancer Treatment (UACT) is an international network of people who share the conviction that cancer treatment and care should be available everywhere for everyone regardless of gender, age, nationality, or financial resources. We are a union of people - people affected by cancer, their family members and friends, people who take care of people with cancer, health care professionals and cancer researchers -- all committed to increasing access to effective cancer treatment and care. We are particularly concerned about the rapidly escalating cost of cancer medication and we believe that cancer medicines and other essential medical tools such as diagnostic tools should be affordable. - We fight for cancer treatment and care to be affordable and available, everywhere, for everyone who needs it. - We believe that the global concept of "access to medicines for all" includes cancer medicines. - We believe that legal trade frameworks must be designed to improve access to medicines and not hamper it. - We advocate reforms that result in new and improved cancer treatments through more efficient systems for financing research and development, in particular through de-linking the cost of R&D from the price of the product. - We demand greater transparency on the part of pharmaceutical companies and government drug approval agencies regarding the relative costs of research and development (R&D) and the prices charged for drugs; revenues from sales of cancer medications should be publicly available. 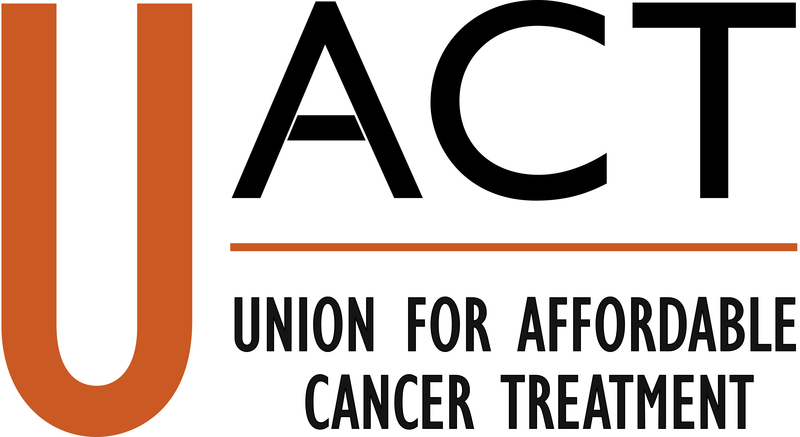 UACT is a membership organization consisting of a body of members who feel passionate about our mission and focus, and a steering committee which plans, guides, and assists in the execution of UACT's actions against high cancer prices. Jordan Jarvis is the Executive Director of Young Professionals Chronic Disease Network, one of the UACT partner organizations. She previously worked on integrating cancer screening and care into existing health programs with Amref Health Africa in Kenya, cancer epidemiology at the International Agency for Research on Cancer (IARC), and cancer policy in low- and middle-income countries at the World Health Organization (WHO). Jordan was a member of the The Lancet Youth Commission on Essential Medicines Policies, a volunteer for the Kenya Cancer Association, and is a member of the Editorial Board of the journal Globalization and Health. She holds a Bachelors of Science from The University of Western Ontario, a Master of Science in Medical Biophysics/Cancer Biology from the University of Toronto, completed a global health fellowship through Duke University and a research fellowship on global cancer control with the Harvard Global Equity Initiative/Harvard Medical School. Dr. Mohga Kamal-Yanni is a senior health & HIV policy advisor in Oxfam. She has extensive experience of health policy and programming in developing countries. Currently Mohga is a key advisor to the NGOs delegation to UNITAID board –having served for 4 years as NGOs representative. For four years she was also a member of the World Bank civil society consultation group. She represented NGOs on the medicine committees of the Global Fund to Fight AIDS, Tuberculosis, and Malaria and was the alternate board member for the Developed Countries NGOs delegation to the Global Fund. Mohga has written policy papers, published articles, and made presentations on health issues including access to medicines, financing and delivery of health care, HIV/AIDS, non- communicable diseases and gender and health. After graduation as a medical doctor in Egypt, she has worked in a number of developing countries as a medical doctor, programme manager, and health policy advisor. Mohga holds an MPhil in Primary Health Care and has been awarded an MBE in 2009. James Packard Love is the Director of Knowledge Ecology International (KEI). He advises UN agencies, national governments, international and regional intergovernmental organizations and public health NGOs, and is the author of a number of articles and monographs on innovation and intellectual property rights. Knowledge Ecology International was created in 2006 as a separate entity to carry out work earlier done through the Center for Study of Responsive Law and Essential Information, where Love was employed from 1990 to 2006. Prior to that, he was Senior Economist for the Frank Russell Company, a lecturer at Rutgers University, and a researcher on international finance at Princeton University. James Love holds a Masters of Public Administration from Harvard University’s Kennedy School of Government and a Masters in Public Affairs from Princeton’s Woodrow Wilson School of Public and International Affairs. In 2006, Knowledge Ecology International received a MacArthur Award for Creative and Effective Institutions. In 2007, Love received the Public Knowledge IP3 award. In 2013, Love received the EFF Pioneer Award, to recognize leaders who extend freedom and innovation in the realm of information technology. In 2015, he received, with his wife Manon Ress, the Joe A. Callaway Award for Civic Courage. Leena Menghaney is a lawyer who works in India on the right to access affordable medicines with a focus on patent law safeguards that protect generic competition in pharmaceuticals. In her professional capacity she works with Médecins Sans Frontières (MSF) Access Campaign focusing on availability of generic medicines from India for HIV, DR TB, Hepatitis and neglected diseases. In her personal capacity, she works on access to treatments for cancer. Leena graduated from the Department of Political Science & International Relations, Jadavpur University, Calcutta, and received a law degree from the Campus Law Centre, Delhi University. Kirsten Myhr is currently a pharmaceutical consultant in public health living in Norway, working for the public sector or independent NGOs. Previously, she was head of a Medicines Information Centre at Oslo University Hospital, an advisor to the Norwegian Board of Health, project officer at UNICEF, a consultant to WHO, and the European Union project in Bosnia, head of the pharmacovigilance unit for the Norwegian Medicines Agency, the Principal Pharmacist at Central Medical Stores at the Ministry of Health (Botswana), the Chief Hospital Pharmacist at the University Hospitals of Tromsø and Trondheim (Norway), and has worked as a board member, advisor or consultant to a number of entities, including the Affordable Medicines Facility for Malaria, and UNITAID (advising Norad). During the years as hospital pharmacist and later she has had a special interest in cancer treatment and has written handbooks on cytotoxic medicines. Kirsten is a long time member of Health Action International and has been involved in the WHO/HAI Measuring Medicine Prices project since the beginning. She holds an MScPharm from the University of Oslo, and a Master of Public Health from the University of Tromsø. Judit Rius Sanjuan currently works as the US Manager and Legal Policy Adviser of the Access Campaign for Doctors Without Borders/Médecins Sans Frontières (MSF) in New York. Previously, Judit had worked at Knowledge Ecology International (KEI) as staff attorney, at an information technology consulting firm, a software company, and in the legal department of an international pharmaceutical company. Judit teaches at the New School in New York, and previously was an adjunct professor at Georgetown Law School and co-authored the first curriculum for the postgraduate course on legal implications of open source software at the Universitat Oberta de Catalunya. She received a Licenciatura en Derecho (JD equivalent) from Pompeu Fabra University in Barcelona, Spain, a Master’s Degree in International Studies from Pompeu Fabra and Geneva Universities, and an LLM in Law, Science, and Technology from Stanford Law School. Catherine Tomlinson is an independent advocate for affordable and equitable medicine access who has previously worked with the Treatment Action Campaign, Médicins Sans Frontières, the Open Society Foundations and the Department of Medical Microbiology at the University of Cape Town. While at the Treatment Action Campaign, Catherine co-founded the Fix the Patent Laws campaign to advocate for legal and policy reforms to improve medicine access in South Africa. Catherine is currently working with the Cancer Alliance to identify patent-related barriers to cancer treatment access, and develop and implement strategies to improve access. Catherine was educated at the University of Washington and the University of Cape Town. It is a principle of the UACT to not accept money from pharmaceutical companies or any other commercial company that does not endorse the objectives of the UACT. For example such as articulated in the World Trade Organization (WTO) Doha Declaration on TRIPS and Public Health. De-linkage principles refer to models for the financing of medical R&D that are not dependent on high pricing of important medicines, often sustained by intellectual property policies that create monopolies. The de-linkage models overcome the objection that lower prices for medicines would have a negative impact on R&D. In the de-linkage approach, there is a combination of research grants and innovation inducement prizes to finance research, none of which rely upon or are linked to drug prices. Full implementation of de-linkage would enable generic competition and low prices for products, while these other mechanisms are used to fund R&D.